Father Frans van der Lugt was a Dutch priest, a Jesuit, who lived nearly fifty years in Syria, serving Christians and Muslims alike. He first came to my attention when I heard about him in May, 2013. The Christian community of Homs, Syria, which numbered in the tens of thousands before the war began in 2011, had been decimated. Many had been killed and many, many more had fled. About 75 remained and Fr. van der Lugt stayed with them. None of them were Catholics, but that did not matter to Fr. Frans. He stayed with them through all the days that Homs was under siege: through bombardment, through lack of utilities, through the hunger that ensued. I saw a video of him pleading to the world in Arabic to remember that they were still there. He was a shepherd, caring for his flock, and they knew his voice. He stayed with them until he was abruptly called home to Jesus on April 7, 2014. He was killed by extremists, the same kind that took James Foley’s life in the middle of the desert this week. It was not the same group, not the same manner, but it was the same hatred, the same lack of humanity. And I know the grief of God above was the same, too. 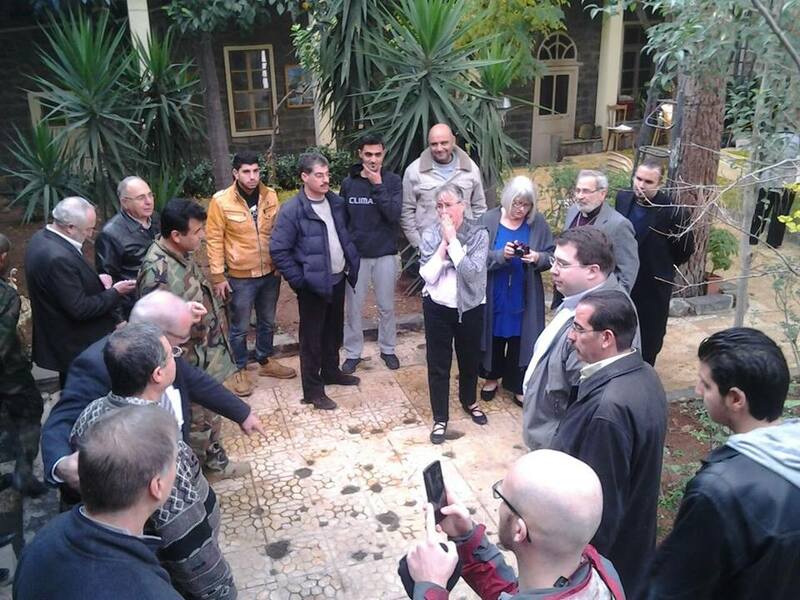 I first heard about Father Frans from my friend Salam Hanna, a Presbyterian pastor who had served among the clergy of Homs, Syria, and knew Father Frans. 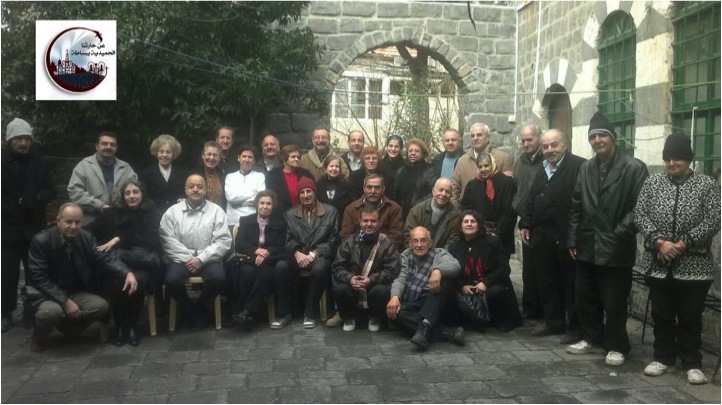 Salam shared a Power Point presentation with a group of us who had come to Lebanon in May, 2013, for an update on what they church was doing in response to the crisis in Syria next door. He showed us pictures of the churches in Homs before the trouble began and he showed us pictures of the damages after war came there in March, 2011. He explained that there had been a community of 60,000 Christians before the war, but now there were just a few left. I found that presentation on my computer when I returned home from Lebanon and Syria just this past week because of an extraordinary encounter I had in Homs. Mazar was one of the few remaining Christians who were shepherded by Father Frans through those three long years of siege. (He is in the picture at the top of this post, back row, sixth from the left.) The old city quarter of Homs was where the insurgent extremists battled the Syrian army for control. Siege tactics to force the extremists out led to terrible conditions for those few civilians trapped between the two forces. Father Frans did what he could for anyone who needed help: he offered prayer and comfort and even the little food he could manage to obtain. He plead their cause on YouTube videos which he managed to get out. Comforter. Provider. Advocate. I had never forgotten this story from the first I heard it and when April rolled around this year and I heard from Salam that Father Frans had been killed, shot in the head by the extremists, I wept for a man I had never met. One week later the siege of Homs was lifted. 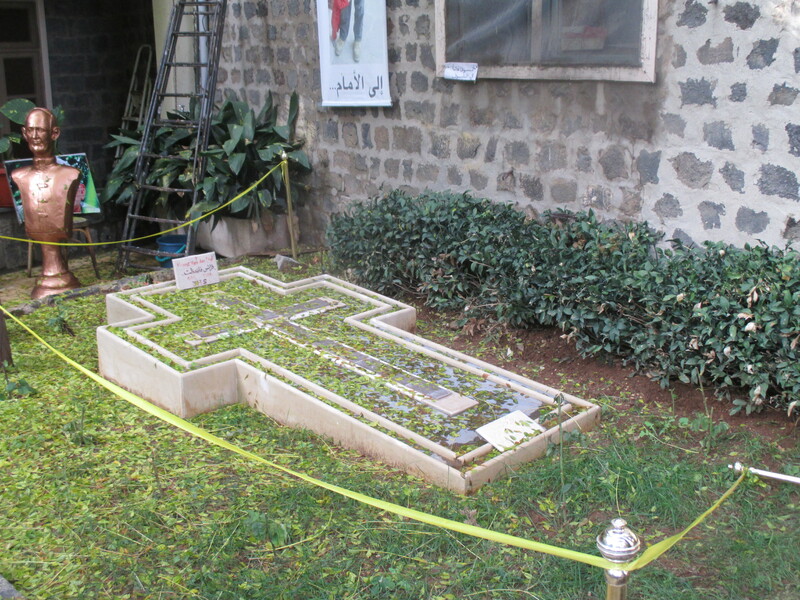 Father Frans was buried in the courtyard of the Jesuit monastery in the old quarter of Homs. It is a quiet place now in that churchyard, and it was my humble privilege to kneel by Father Frans’ resting place on Saturday, November 22, with a group I traveled there with from The Outreach Foundation, as well as other clergy and parishioners of the churches there who accompanied us on a tour of seven churches in Homs. I wrote about it in my post, Stations of the Cross. This was the one place I desperately needed to come to and pay my respects to a man who gave his life for others in need. If ever there was a present day model of Jesus Christ, this was him. A Dutch Jesuit who poured out his life for the people of a land he came to call his own and whose blood poured out in the place where he served. Mazar was one of those who greeted us as we entered this place. Not smiling and happy at the visit of American Christians as others there were. Mazar had sorrow all over his face as we came to Father Frans’ grave. And then we were told the rest of the story of Father’s last day. One week before the siege was lifted, extremists came to this church where Father had tended the flock for these past three years. Surely they knew the end of their time in Homs had come. And they had come for Father Frans. We were told that they pulled him out of his house and forced him to sit in a chair, guns pointed. Mazar came out of the house to protect him and to stop them, but they pushed him aside. In front of Mazar they took the life of this man of God, this man of peace, this shepherd, comforter, provider, advocate. This is the picture that Mazar has in his mind’s eye from then to now and to his last day. Someone snapped this photo of me reacting to this story. Mazar is in the lower left corner. His sweater is gray with a black stripe on his sleeve. I will never forget this moment, this story, this gentle man’s face as we heard the story. I am grateful that this trip brought me to this place, this holy ground, where one man was willing to try to stop the violence that was about to happen here. 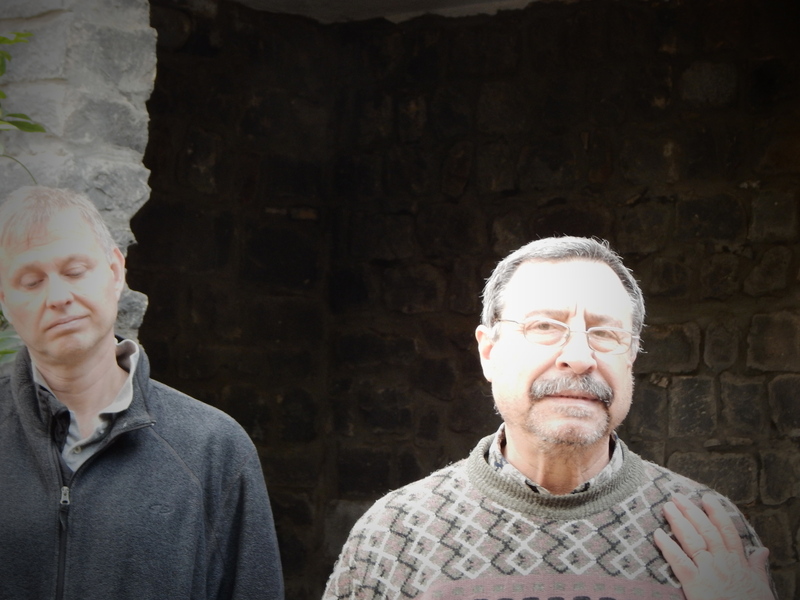 And now that I know Mazar’s story and how it intertwines with Father Frans and the story of love poured out in Homs, Syria, it is my responsibility to share it with you. And now that you know, will you pray for Mazar and the community of Christians who are returning to Homs to rebuild their churches and their lives and their country? Don’t turn off the news when they are reporting about Syria. Turn it up. Turn your attention to it. Remember that there are people who live there and call it home. They worship in churches. They worship in mosques. They are neighbors and friends and countrymen. Father Frans loved them all. I thank you and I know Mazar would, too.